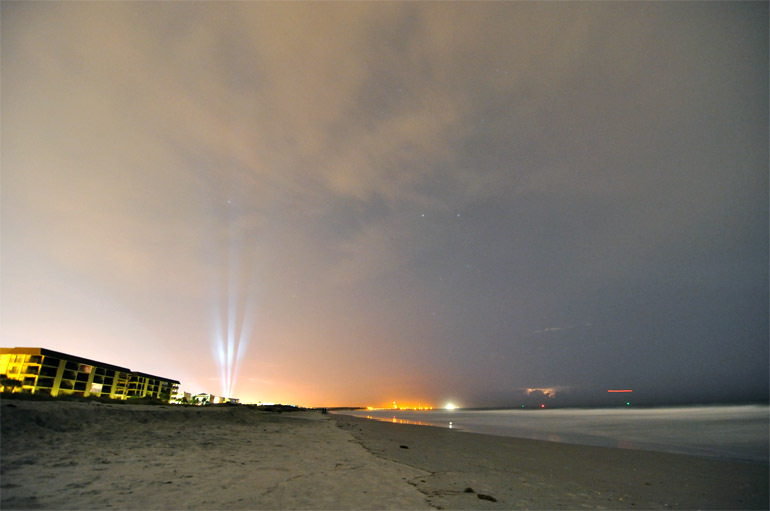 A two-image stack shows the three rays from the launch pad floodlights, the streak from the Atlas rocket and a thunderstorm on the horizon in the right corner. The two original photos are at the bottom of this post. This shot, showing just the streak, was adjusted to be a little brighter. The original also is included below. Night launches happen every once in a while on the Space Coast, but for a guy who works from 4 p.m. to 12:30 a.m., there's rarely a chance for me to shoot them up close. I got that opportunity early Monday morning. A United Launch Alliance Atlas V rocket carrying several communications satellites blasted off at 1:55 a.m., after a delay from more than a week ago, when a technical glitch prompted a scrub on a perfectly clear evening. On Monday morning, though, the weather wasn't nearly as conducive. Some lower-level clouds from a front moving over Florida obstructed the view of the rocket's main engines and three solid rocket boosters as the craft lifted skyward. 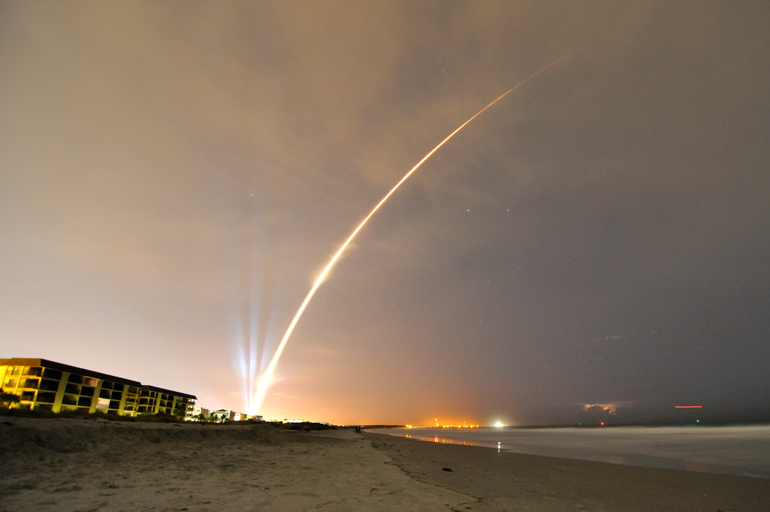 My strategy in photographing the launch was to get a time-lapse photo from the beach in the city of Cape Canaveral, south of the Air Force's launch pad 41. It's not the closest location, but it's more photogenic than Port Canaveral, where power lines tend to mar the images. The problem with getting close to the pad for night launches is that you start to get too close for a wide-angle lens to capture the entire arcing streak of the rocket. But I figured that my 11mm Tokina would do the job, even with a little beach in the foreground. The top shot is the fruit of my efforts early this morning. But it wasn't in the least premeditated. To test the photo's composition, I took a 20-second exposure at a high ISO setting of 1000 and an aperture of f/3.5. That allowed more light into the camera in a shorter period of time. This was done five minutes before the launch. After the test shot, I never touched the tripod for the actual blastoff. I changed only the ISO to 100 and the aperture to f/18 - necessary settings for when a rocket turns night into day. What I was left with - and didn't realize until I got home - were two images showing different details of the same scene. The launch photo shows the streak, but - because of the closed aperture - it didn't pick up the spotlight rays from the pad, even though the shutter was open for two minutes and 14 seconds. Other details not included in the streak shot were an offshore lightning storm on the horizon, the building lights along the beach and a few stars shining through the cloud cover. Because I never moved the tripod between shots, the two photos lined up perfectly when stacked one on top of the other. In Photoshop, I layered the images and blended them together to show the details of both scenes in one composition. This is my first attempt at such an image in Photoshop, and I expect to get better at it in the future, especially when I plan ahead. This first photo, taken five minutes before the launch, is considerably brighter and shows more of the details of the scene. 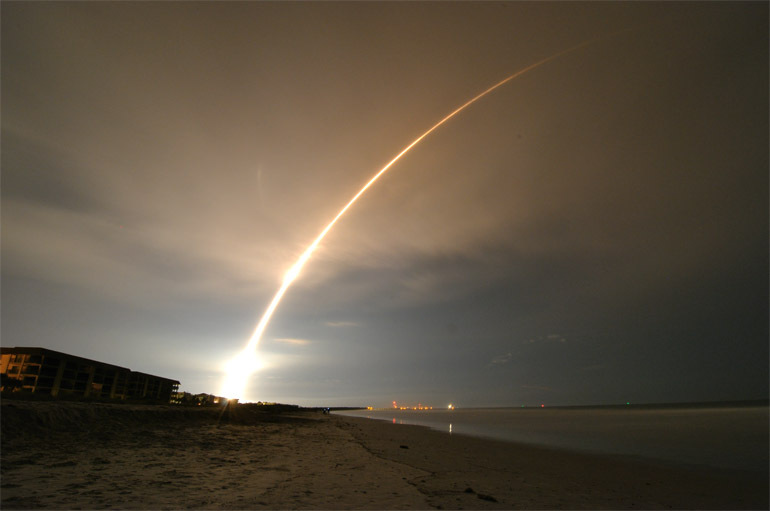 The actual launch shot shows mainly just the time-lapsed streak. The camera itself can't really handle such high contrast between the flame trail and the dark, unlit beach. The rocket actually trailed off the right edge of this photo, but by the time it reached the edge, the flame was so faint - thanks to cloud cover - that the camera couldn't pick it up.